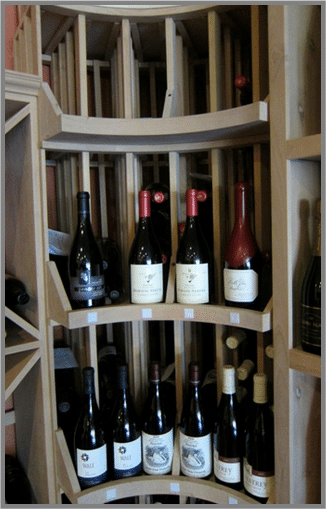 Commercial Wine Racks – Dallas Texas Wine Store Project. . 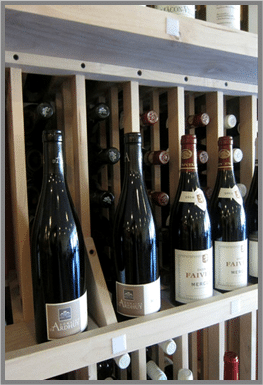 Choosing the correct commercial wine racks and design concept in your wine store is almost as important as choosing the correct wines to carry. 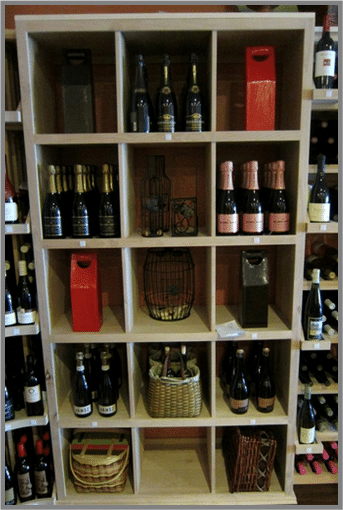 Wine racks should not only look good with your selected decor but should display your wines so that the customers can easily see what is offered and have access to the bottles they wish to purchase. 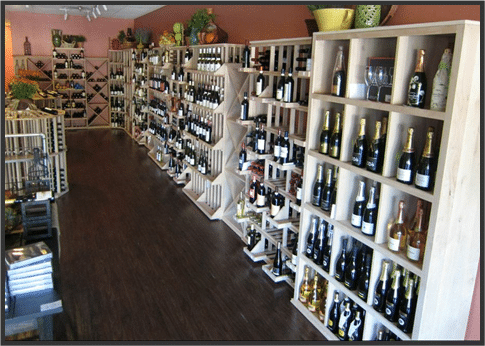 I believe that the wine store that we are about to walk in through has accomplished both of these things with the help of the Wine Cellar Specialists design and install teams. 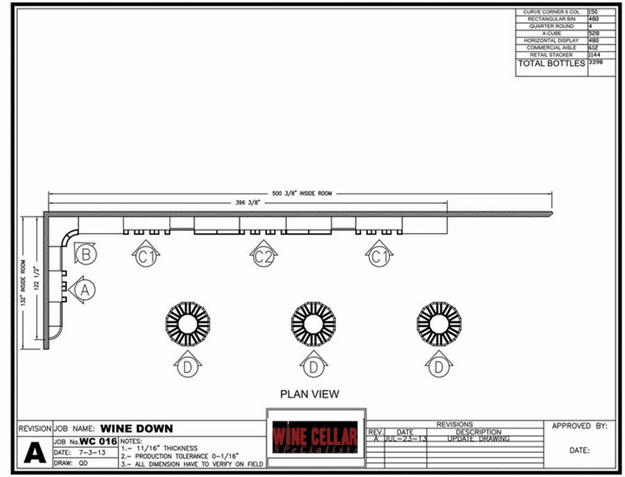 What you’re looking at is the overhead view of the floor plan for the Wine Down commercial wine cellar Texas. As you know at the upper right hand corner, we accomplished a storage for 3, 398. Here you can see that each elevation is marked elevation A, B, C1, C2 and C1 again (these are the same racks), as well as D. In the overhead view, you can see that are in an L-shaped configuration. This is a Texas wine storage and tasting room. It’s not like a regular wine market that has thousands of wines. 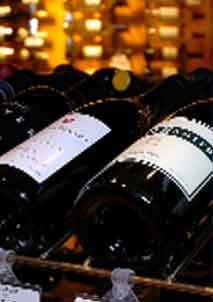 The wines are very selective in this market. You’re looking here at elevation A. 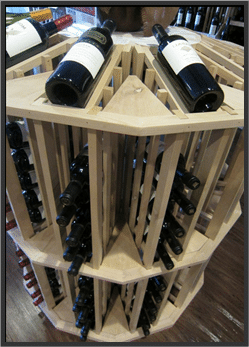 What we’ve done is combine both residential and commercial wine racks Texas so that we have height differences and to create an interesting look which you’ll see later in our pictures. Elevation A begins with residential quarter round and solid X-bin then goes on to a 2-col retail stack; again a solid X-bin in a residential. We move on to elevation B where we have a round corner that holds 4 bottles wide. This is a commercial rack so it is one of the tallest. The back wall begins with solid rectangular bin storage and our commercial racks which are 84 5/16 inches high. 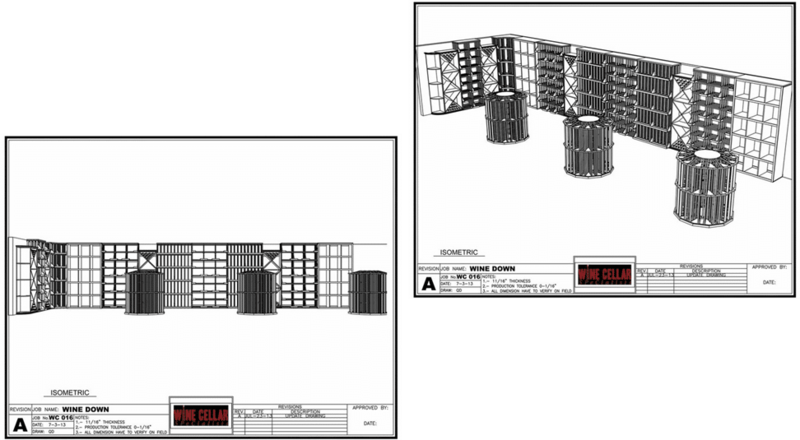 We then go with a 3-column retail stacker and drop down to a solid residential X-bin. Moving on to the next section, what we have are the horizontal racks. 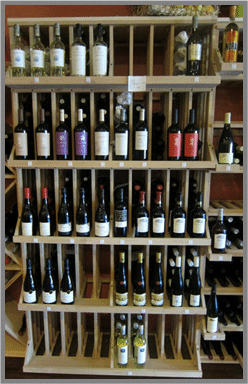 This is a display row here where bottles stand up in front and behind. The bottles sit in these vertical bins. We have then a 3-column retail stacker and another horizontal rack. We also have commercial rounds in the center of the aisles out from the 2 walls. 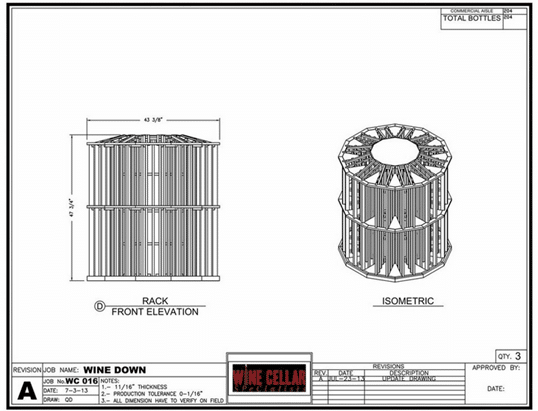 You can see on the 3D overhead view showing where our center commercial round wine racks are and the 2 L-shaped walls. On the picture below, you can get a 3D view of the entire walls, looking at it form the right end. 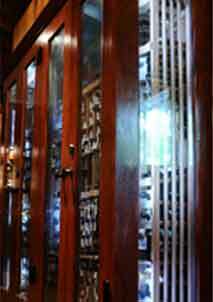 Now we’re going to show you some photographs of the Wine Down Wine Market Texas custom wine room that was completed. This is the Wine Down Wine Market, here is the room. We’ve done the racks in unfinished knotty alder. This is very good wood to use for a wine market. This is one of the lesser costly wood but still have a beautiful look to it. You can see how the quarter rounds moved on into the corner and down to the side wall and the rounded display in the center. You’ll the quarter round and the solid X-bin; your 2 column retail stacker. These photos were all taken right before the grand opening. So the stickers are all in front of the racks, I don’t believe they’ve put in the price tags and things on yet. You can see all the beautiful racks and how that height difference really makes a difference. 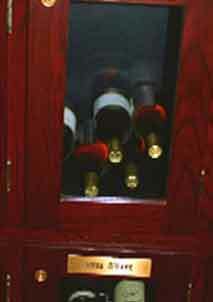 Here is the 4-bottle curved corner (LEFT). We have the rectangular bins (RIGHT). This is the long wall and the height difference really adds something to the room. You can see on the horizontal rack, where you have the ledge going all the way across; the bottles are stacked above each other in that rack. Here’s a little close up of it. Here is a retail stacker (RIGHT). 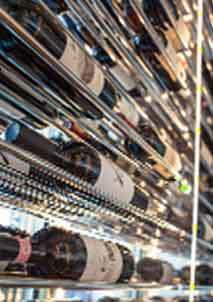 You can see all the display ledges on the front of these racks, all the commercial wine racks near rounds. Looking down from the right hand side, here’s a little close up of one of those round center islands, and from the window of the store. So, I hope you liked walking through this. I think that they did a beautiful job. Our installers did install these for the Wine Down Market, and they’re very pleased. Grand opening was the day after these photos took place in the Flower Mound, Texas. So if you ever buy that way, look them up. Have a glass of wine or buy a bottle or two. 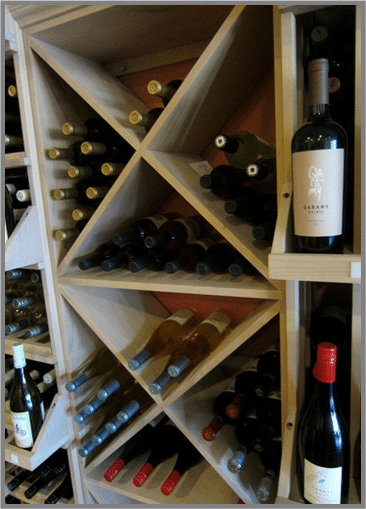 Give us a call at Wine Cellar Specialists; we will be happy to help you design and give you the commercial wine racks that work for your wine store.